"Root rot" is the term loosely used to describe any number of common problems that affect the roots of plants such as the zucchini. These problems range from environmental conditions to common insect pests and fungal diseases. If the roots are severely damaged, the plant will die. For this reason, it is important for the home gardener to take steps to prevent zucchini root rot. Zucchini root rot can be caused by several things. The cucumber beetle has larvae that hatch and live in the soil. According to the University of Illinois, these larvae feed on the roots of the plant. The bodies of the beetles also transport a bacteria that causes the roots and the plant to wilt and rot. Root rot can also be caused by fungi in the soil that infect the roots of the plant. The fungi thrive in overly wet conditions, such as when standing water collects around a zucchini plant due to rain or over-watering. 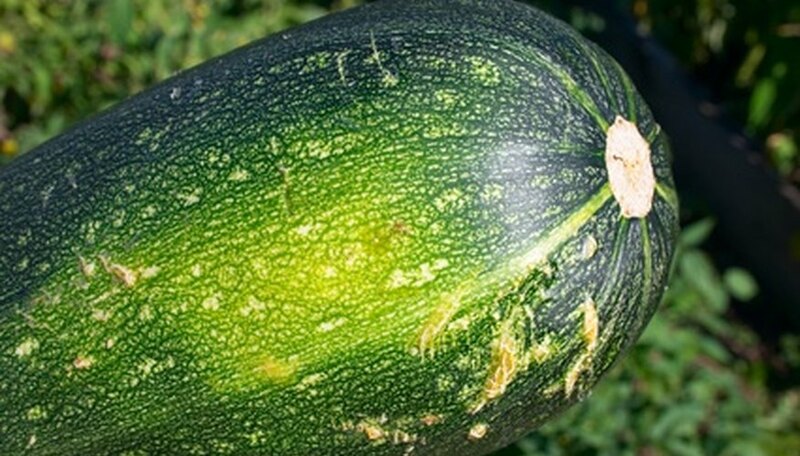 Zucchini plants affected by root rot show overall signs of decline. In severe cases, when the inner core of the root is invaded, the plant will wilt quite rapidly. When only the hair roots are infected, the plant will show a gradual decline. The leaves will slowly turn yellow and wilt. Upon closer inspection, the roots of the zucchini plant will be brown and soft. Strong, healthy plants are less susceptible to root rot, according to Veggie Gardener. Good soil drainage is essential, as are proper watering practices. Poorly-draining soil can be improved by adding organic matter and perlite or sand to the planting site. In addition, zucchini plants should never be planted in depressions where standing water can collect. Insecticides can be used to control for the cucumber beetle and other insect pests, such as the squash vine borer, that can damage the roots of the plant. Insecticides that contain carbaryl or malathion are effective, according to the University of Illinois. These chemicals should not be combined, however, as together they may kill the zucchini plant. While insecticides that do not combine these chemicals will not harm the production of the fruit, they can sit on the skin of the zucchinis. For this reason, it is important to thoroughly wash the zucchini before eating if you use insecticides. The conditions that cause root rot may affect other, nearby vegetables. Many of these bacterial diseases can live in the soil for over two years. Home gardeners should not plant zucchini in areas where other vegetables have been affected with root rot in previous years. Individual plants should be amply spaced (3 feet is recommended by the University of Illinois) so that they get plenty of sunlight and air circulation, which cuts down on fungal growth.